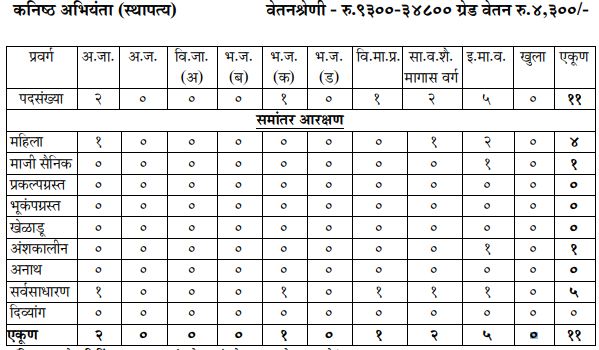 Aurangabad Mahanagarpalika Bharti 2019 is announced to recruit 11 posts of Junior Civil Engineer. Aurangabad Municipal Corporation, Maharashtra has released a total of 11 jobs for the Junior Engineer (Civil) posts. Official Notification PDF is given in this post, read it carefully and if you are eligible for Aurangabad Mahanagarpalika Recruitment then you can apply by filling the offline application form. All the candidates need to submit the Application form by presenting on the given address with all necessary documents on 24 February 2019 at 11 AM. Candidates will be select by taking 200 Marks Exam and the result of the exam will publish on the same date. You will get brief information like Educational Qualification, Selection Process, Eligibility Criteria and Important Dates in the below article. So read this article till the end to get all the information regarding this recruitment. All the eligible candidates need to download a given PDF advertisement for detailed information and Application Form. Then, the candidate needs to pay Application Fees i.e 300 Rs. by clicking Here or given pay link. Candidate should present on the given address on 24 February 2019 Time 11 AM with Application Form and all required documents. All other information regarding the exam and all given in below ADVERTISE. Address: Devgiri College and Devgiri Engineering College, Station Road, Aurangabad.